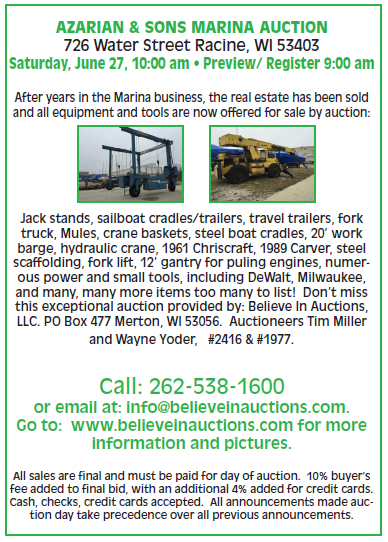 Medium / Large Jack stands, sailboat cradles/trailers, travel trailers, fork truck, Mules, crane baskets, steel boat cradles, 20’ work barge, SPL 35 BFM Marine Travelift, Yellow Grove hydraulic crane Model RT-58, 1961 36’ Chris Craft, 1989 32’Carver, 1986 32’ Cruiser w/ 2 Chrysler motors,1976 33’ Carver w/ 2 Ford motors, 1990 31’ Carver Montego w/ 2 Mercury T-260 engines, Clark Fork Truck, steel scaffolding, steel stairs, power washers, 40’ Walkway, fork lift, 12’ gantry for puling engines, portable pump out/pump on trailer, numerous power and small tools, including DE Walt, Milwaukee, and many, many more items too many to list! Don’t miss this exceptional auction provided by: Believe in Auctions, LLC. PO Box 477 Merton, WI 53056. Auctioneers Tim Miller and Wayne Yoder, #2416 & #1977. Call 262-538-1600, email info@believeinauctions.com or Click Here for more information and pictures. All sales are final and must be paid for day of auction. 10% buyer’s fee added to final bid, with an additional 4% added for credit cards. Cash, checks, credit cards accepted. All announcements made auction day take precedence over all previous announcements. Additional preview by appointment only.